People love to eat fries any time of the day. Our massive community of bargain hunters has gathered the best cheap fries offers, deals, and voucher codes. Discounts and voucher codes that you can use at reputable UK retailers await you without ever having to leave your home. Save as much as 70% when you buy at Iceland, Tesco, Amazon, and other UK sellers. Make sure to use the latest voucher codes to save some money on the side. Here you can compare and look for cheap fries products online most especially if you have a limited budget. Crispy French Fries Now Available Now Only £2! All the best fries sale and discount codes in the UK! Did you know that the name "French fries" actually originated in Belgium, rather than France? According to National Geographic, American soldiers first came across this savoury side dish during World War I in Belgium (where they had been frying potatoes since the 1600s) — and since the dominant language in Belgium is French, well, they supposedly thus named them "French fries. So here we go, enjoy every bit of fries and feel the awesome and unique taste of it that we are all cravings for. Cravings? Yeah, Fries can satisfy that. Different Cuts of Fries Shoestring fries, crinkle cut, curly fries—we'll eat 'em all, but we totally believe that the preparation style affects the taste of the french fry. Are we delusional? Probably, but that's our story and we're sticking to it. Potato Wedges. Potato wedges sit at the very bottom of the french fry totem pole. Sure, these chunky fellas contain a whole lot of yummy potato filling, but they miss the mark when it comes to the crunchiness we want from our french fries. They have more of a baked potato feel, and they get soft and limp pretty quickly as they cool down. Like, we won't say no to eating them, but they're far from our first choice. Waffle Fries. Waffle fries have the exact opposite problem of the potato wedges—too much crunch and not enough potato. Sure, they look really cool—but they're just not as satisfying to eat. It's like these fries can't decide what they want to be—are you a basket of steaming french fries or are you a bag of Ruffles? Obviously, it can't be both, which just kind of results in a weird hybrid that doesn't always work for us. Crinkle Cut Fries. Crinkle cut fries just look like a good time. They're thick and heavy and they have those awesome waves in them that make eating them a little more adventurous. Again, they don't have the french fry crunch we're always looking for, so you have to eat them hot otherwise they're just gross. Still, they're a perfectly enjoyable french fry experience. Steak Fries. Steak fries might seem like the less fun-looking version of crinkle cut fries, but they actually have a nicer taste. Steak fries are thick, so there's plenty of potato to go around, but they're also double-fried, giving you that yummy crunch that the crinkle cut fries are missing. There's honestly nothing that bad about steak fries except that better fries exist. Curly Fries. There's something so satisfying about curly fries. First of all, they're just so fun. Don't ask us how they got the potato to keep that shape, but we don't care—we love them. Plus, they have that delicious crunchy outside and soft potato filling that's perfectly balanced due to the flawless curl. Curly fries are awesome, and you'll never change our minds about that. Garlic Fries. Put garlic on anything and you already know we're sold. Given that knowledge, other types of french fries didn't have much of a chance in comparison to the garlic fry. The slight addition of garlic makes these fries overwhelmingly delicious, so there's honestly no other choice for the french fry king. French fries vs potato chips? Which one should you buy? Well if you’re a fries lover, then you’ve come to the right place! 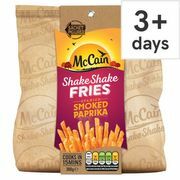 Here at Latest Deals you’ll find cheap fries deals and best price on all french fries crisps flavours including Smiths bacon fries and Mccain fry n dip. 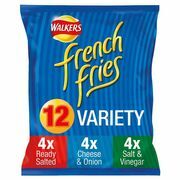 We also have price drops on your favourite Walkers french fries flavours such as Walkers french fries salt and vinegar and Walkers Worcester sauce. So whether you’re looking for British potato chips or french fries packet, you ‘ll find it here at everyday low prices! 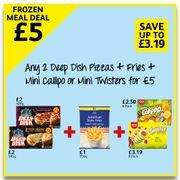 Most UK online retailers such as Amazon, Tesco, Iceland, Londis, and ASDA among others often have sale events such as clearances, and flash sales where you can save as much as 30% off on a wide selection of fries products. They also reduce to clear during Black Friday, and Boxing Day. You can also get additional money off when you use the latest fries discount codes we have here. Plus, there are also voucher codes where you can get freebies and free shipping! Keep in mind that the offers and deals we have here are available for a limited time only, so make sure to grab them right away before they expire. Do not forget to bookmark this page and never miss out on fantastic discounts and amazing deals in the UK!